Are you looking for a place to call home while you’re in Barcelona? We have it for you. It can accommodate up to 6 people, with 3 bedrooms overlooking a charming street of Ciutat Vella. Comfort, space and a privileged location. This apartment is a great one for travelers who plan long stays in Barcelona. It’s located in one of the most picturesque barrios: El Born. Examine its streets and the charming life from any one of its three balconies. 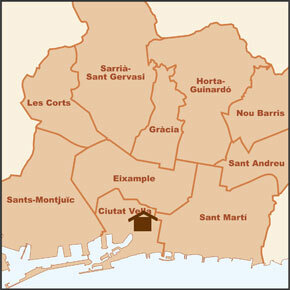 You’ll feel as one more local of the Catalan capital. The rooms within the 70 m2 guarantee a complete and homey vacation. Whether you are a family with children, friends travelling together or a couple looking for a romantic experience. It has three bedrooms, two double beds, two single beds and one single sofa bed. Thus, it’s designed to warrant privacy and good moments for groups of up to six people. The building, built in 1850, was renovated in and elegant and modern style. Likewise, the interior of the apartment was redesigned and equipped with everything brand new. You’ll find a TV with DVD, and furthermore, you’ll be able to prepare gastronomic delicacies in the kitchen and enjoy your country’s typical flavors. You’ll have everything you need to make this your home away from home in the catalan capital! While you’re indoors, you’ll be able to enjoy WiFi connection. Outdoors, you’ll find the best attractions a few feet away. El Born is located a short distance from the sea, so you can have a pleasurable day at the beach, if you so desire. Restaurants, coffee shops and bars are all around you. Go to the Museu Picasso; visit the Palau de la Música Catalana very close to the apartment. Don’t leave any corner of the city unexplored! Monthly rentals: free WiFi, expenses are included. Barcelona Estació de França - 6 min. T1 Aerobus + L3 - 42 min. T2 Aerobus + L3 - 51 min. It is difficult to find a more central location in Barcelona than this. Crossing Via Laietana, a main avenue that connect L’Eixample with the Port, you enter the historic Barri Gótic - Gothic Quarter. The flat is literarily, just a few steps away from seafront, the Port Olímpic (Olympic harbour), art-galleries, delicatessen, design boutiques (this being one of the city’s hottest shopping areas), restaurants, cafés, bars and main attractions as the Museu Picasso, 20 meters from the flat, and the Palau de la Música Catalana, a leading concert hall (World Heritage Site by UNESCO). This might be the city’s nicest area to take a stroll in, and it is a short distance to several metro lines making very easy to reach those attractions that are not in the immediate vicinity. Really good location within walking distance of many places. The flat was tidy and cozy and the beds were comfortable. The hosts were really helpful and always very welcoming. Beautiful flat. The location was perfect and the place very comfortable. Rooms were nice and clean and the host was very helpful and friendly.